Measles remains the most common disease in other parts of the world and this is the leading cause of vaccine preventable deaths among young children. There has been pockets of epidemics in Europe and South Africa in the last year according to the Centers for Disease Control and Prevention. Immigration can not be avoided and exposure to the measles virus is inevitable in the United States. The problem is with the scare that "MMR is linked to autism" there are a number of families who refuse to vaccinate their children and it will only be time before we see this spread all over the country. 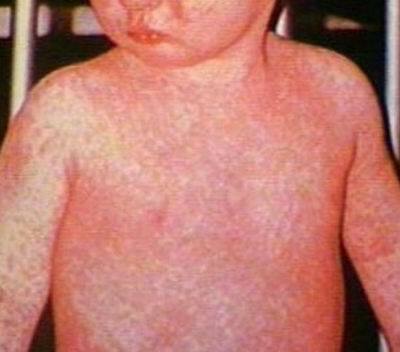 Since most physicians have not seen measles for a long time they may not be familiar with how it presents. The only natural hosts of the measles are humans and is transmitted by direct contact with infectious oral droplets. Incubation period is from 8 to 12 days from exposure to onset of symptoms. There is a specific antibody test for measles IgM antibody to test for the infection. There is no specific treatment for measles, it is mostly symptomatic . The vaccine is most most effective in preventing this from occurring. This is extremely sad when it attacks the child.A whole life with a partial numb tongue and half the body not functioning well is definitely a problem. Thank you for posting this.I'm studying infections disease now and your pictures was very helpful.